Many hospitality workers dream of owning their own business one day. Or maybe you already do, but you want to try out something different on the side. You might have been in a kitchen for years following someone else’s direction, or maybe you want to take your salesmanship out of a traditional restaurant setting and onto the street. Starting a food truck can offer a solution to any one of these problems. Food trucks are gaining in popularity, and the trend doesn’t look to be slowing down anytime soon. To turn your dream into reality you’ll have to write a business plan. This is a lot less fun than daydreaming about your food truck business, but it is a necessity. Your business plan needs to include a company description, an analysis of your target market, a marketing strategy, and a projection of profits. If you’re getting a loan, this is what you’ll bring with you to your loan officer when you make a proposal. Also, if you’re getting a loan, the projected profit margin is key because the lender will expect to be paid back. At first glance, food trucks seem a lot cheaper than a brick-and-mortar restaurant, but they can be fairly expensive. The biggest purchase you’ll make is the truck. You also need to consider small business permits and licenses, as well as any upgrades you plan on doing to your truck. To do this, check with your state Department of Labor. You can also consider using equity for your loan, asking a friend or relative for help, or approaching a small business lender. If you go the small business lender route, you’ll have better luck if you have a solid business plan, good credit, and maybe even collateral. I love living in Shawnee, Kansas a suburb of Kansas City. Besides living in a fantastic community, we have a fantastic local Food Scene. Our good friend Brad Pippin is looking forward to his grand opening in the next few weeks. Brad will be serving up local favorites from his Food Truck named “Home-Plate” located at one of our sporting complexes in western Shawnee or catering private events from his mobile culinary palace. At the end of the day, what will make Brad and his Food Truck so popular is his passion for cooking great food. You can find used, new, or lease options for food trucks; a quick internet search will bring up endless options. You can look at local or national online classified ads or purchase a customized new truck. Buying a new truck is the most expensive route, but the appeal is that you can build and customize it exactly to your liking. 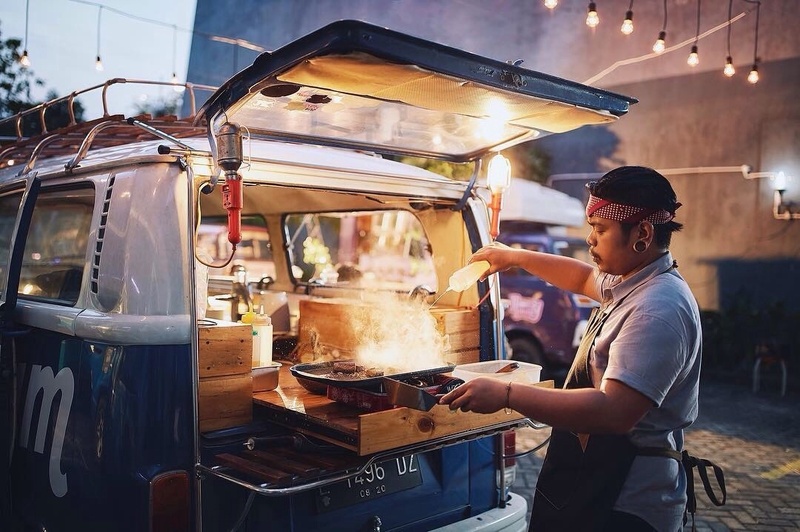 Leasing is another option to consider when starting a food truck business. If you’re even entertaining the idea of starting a food truck, chances are that you have a passion for food. Successful food truck owners have a small and specialized menu. They are not a “jack of all trades and master of none” like some big chain restaurants. Quite the opposite, food trucks are the best at everything that they do including having a well designed menu board. As the old saying goes – it’s all about location, location, location. Choosing a place to park your truck and sell your goodies might be the most important decision to make. Research the market and examine the competition – be it food trucks or brick-and-mortar restaurants. You are limited by ordinances and zoning, so make sure to do your research. Local events charge you to park in their space, but they will advertise for you and tend to bring in a lot of customers. Remember: hospitality establishments of any kind require good infrastructure and tools to maintain organization, shift schedules and employee management. Inquire with our team at ShiftNote to learn about how we can help your business reach maximum efficiency! Like this Blog? Check out more blogs just like this one at ShiftNote! Passionate about setting up systems and procedures that assure success, training, consulting, growing sales, strategic planning, creating "raving fan" customer service and just about anything related to food service. 25+ years in food and sales as well as growing hundreds of concepts with different operators (I have seen them all). I enjoy cooking, computer software, Taekwondo and spending time with my family. We started ShiftNote in 2007 to help organizations like yours create a better platform for shift-to-shift communication across their organization. Our purpose is to serve you with the best online digital logbook and employee scheduling software on the market so you can spend more time focusing on growing your business. Keep Your Shift From Hitting the Fan: Subscribe Below and Stay Informed!